Tony Zemaitis always pretended to leave the room. Whenever someone came calling. asking him to build a guitar. the canny luthier would hand them an example instrument. excuse himself from the lounge on some pretext. then spy through the crack in the doorway to watch how the would-be customer played. It was the only way you could get a real idea of their technique and what type of guitar would suit them. he said. Stand in the same room and they'd 'perform'. attempting to play to the rules. You'd be building to a pose. Having a guitar custom built can be a worrying time. Apart from the fear that you may genuinely not like the finished instrument (but still be stuck with the bill). there's that feeling of performance. of putting your views and desires on guitar construction forward to an expert in the way you put your songs forward to an audience. These anxieties are unfounded. nurse. and to demonstrate that custom construction need not be a path peppered with tranquilisers. we followed the history of one guitar. one player and one builder. In August 1984. Robin Willow approached luthier David Bourne. having been appraised of his name by other players on Robin's folk circuit. Each player will have different reasons for deciding on a custom instrument instead of a production model. Robin had two main criteria - (11 as a classical guitar player needing to increase volume and brightness at gigs. he wanted to change to a steel-string without losing the familiarity of a classical feel and balance, and (21 having based his set round a specially written trilogy styled on Anne McCaffrey's 'Dragonslayer' books. he wanted an acoustic with a shape and decoration that would accommodate the concept. The question of retaining the balance was solved surprisingly easily. 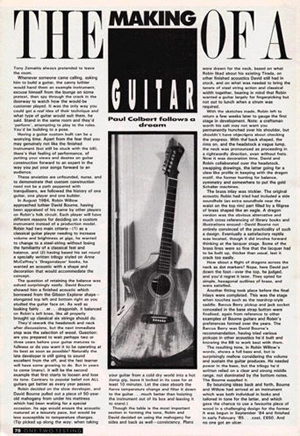 David Bourne showed him a finished acoustic which borrowed from the Gibson Explorer shape-elongated top left and bottom right as you studied the guitar face on.As well as looking fairly. - - er - - . dragonish. it balances on Robin's left knee. like all properly brought up classical six strings should do. They'd rework the headstock and neck after discussions. but the next immediate step was the selection of wood. Question: are you prepared to wait perhaps two or three years before your guitar matures to fullness or do you want it to be operating a its best as soon as possible? Naturally the late developer is still going to sound excellent from the off. and the fast learner will have some growing to do. But in years to come (many). it will be the second example that first starts to loosen and lose its tone. Contrary to popular belief not ALL guitars get better as every year passes. Robin decided on the slow developer. and David Bourne pulled out a piece of 50-year- old mahogany from under his mattress which had been waiting for a special occasion. Its age would ensure the acoustic matured at a leisurely pace, but would be less susceptible to temperature changes. (Tip picked up along the way: when taking your guitar from a cold dry world into a hot damp gig. leave it locked in its case for at least 20 minutes. Let the case absorb the fierce temperature change and filter it down to the guitar. . much better than hoisting the instrument out of its box and leaving it to stand. Though the table is the most important section in forming the tone. Robin and David decided on using the mahogany for sides and back as well - consistency. Plans were drawn for the neck. based on what Robin liked about his existing Tirada. on other finished acoustics David still had in stock. and on what was needed to bring the tenets of steel string action and classical width together. bearing in mind that Robin wanted a guitar largely for fingerpicking but not out to lunch when a strum was required. With the sketches made. Robin left to return a few weeks later to gauge the first stage in development. Note: a craftsman worth his salt may not want you permanently hunched over his shoulder. but shouldn't have objections about checking the progress. With the' back shaped. the rims on, and the headstock a vague lump, the neck was pronounced as proceeding in a rightwardly direction, even without frets. Now it was decoration time. David and Robin collaborated over the headstock. swapping drawings. the latter going for a claw-like profile in keeping with the dragon motif. the former hunting for balance. symmetry and somewhere to put the gold Schaller machines. The brass inlay was trickier. The original acoustic Robin had tried had included a side soundhole (an extra soundhole near the waist on the top rim) part filled by a filigree of brass shaped like an eagle. A dragon version was the obvious alternative and much cross referencing of library books and illustrations ensued-David Bourne not entirely convinced of the practicality of such a design. Eventually a satisfactory reptile was located. though it did involve forward thinking at the lacquer stage. Some of the brass lines were so fine that the lacquer had to be built up, thicker than usual. lest it crack too easily. How about a flight of dragons across the neck as dot markers? Nope, here David put down the foot-over the top. he judged. and you'd regret it later. They opted for simple. hexagonal outlines of brass. and were satisfied. Another fitting took place before the final! inlays were completed. This was the stage when touches such as the teardrop-style saddle. Barcus Berry pickup and jack socket concealed in the base strap button were finalised, again from reference to other examples of Bourne guitars and Robin's preferences formed over the years. The Barcus Berry was David Bourne's recommendation. having tried various pickups in other acoustics he'd built and knowing the BB to work best with them. The resulting tone. in Robin Willow's words, shows a full bass end. but is surprisingly mellow considering the volume and sustain the guitar produces. He needed power in the bass. but the trilogy he'd written relied on a clear and strong middle range. not dominated by the bottom notes. The Bourne supplied it. By bouncing ideas back and forth. Bourne and Willow had arrived at an instrument which was both individual in looks and tailored in tone for the latter. and which gave the chance to use a favourite piece of wood in a challenging design for the former. It was begun in September '84 and finished in early February '85... cost. �650. And no one got an ulcer.